U.S. Air Force Staff Sgt. Dillion Matautia, 86th Logistics Readiness Squadron inbound cargo non-commissioned officer in charge, right, receives recognition from U.S. Air Force Brig. Gen. Mark August, 86th Airlift Wing commander, on Ramstein Air Base, Nov. 21. Matautia received the honor of being Ramstein’s Airlifter of the Week. An 86th Logistics Readiness Squadron inbound cargo non-commissioned officer in charge received the honor of being Ramstein’s Airlifter of the Week on Nov. 21. The 86th Airlift Wing commander and command chief lauded U.S. Air Force Staff Sgt. Dillion Matautia for his excellence in executing the Air Force’s mission across the European theater of operation. 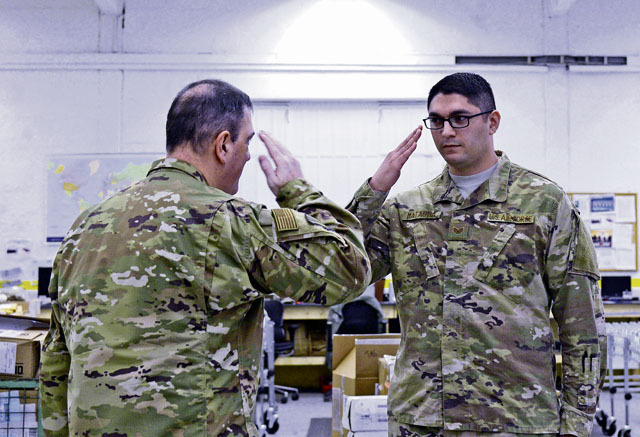 Matautia, a Washington state native, led 10 active duty personnel and Local National team members who were recognized as the sole receiving point for two NATO exercises and President of the United States support. Aside from operational accomplishments, Matautia and his team collaborated with 86th Munitions Squadron on a 24-hour operation to receive Ramstein’s largest shipment of ordnance since Operation Allied Force in 1999, in support of NATO’s European Deterrence Initiative. Matautia expressed gratitude to the LRS for their support and is thankful for having the opportunity to serve in the U.S. Air Force. The Airlifter of the Week program recognizes Ramstein Airmen who, through hard work and dedication, make the 86th AW the World’s Best Wing.